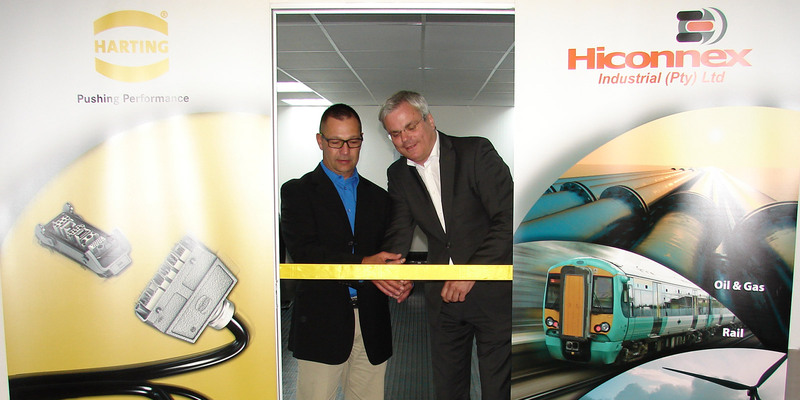 The HARTING Technology Group is expanding its business activity in South Africa. Han-Modular® connectors are now produced for the train division of the French industrial group Alstom. HARTING has a sales office in Johannesburg. The Technology Group is able to provide services and solutions for its partner Hiconnex Industrial to comprehensive national standards and with the well-known HARTING quality. The cable and connector distributor Hiconnex Industrial handles the complete assembly of Han-Modular® connectors. These Han-Modular® connectors are fitted into Alstom trains, which are then delivered to the South African national transport company PRASA. Chris Brand (left), General Manager of Hiconnex Industrial, and Bernd Fischer, General Manager Corporate Regional Management of HARTING Technology Group, are pleased about the partnership. “This partnership is a win-win-win situation for all companies involved: for Alstom, for Hiconnex Industrial and for HARTING,” says Bernd Fischer, General Manager Corporate Regional Management at HARTING. And, what is also very important, with this project all companies support the local market in South Africa. “We are delighted that Alstom is impressed with our expertise and quality products in the rail sector,” says Chris Brand, General Manager of Hiconnex Industrial. HARTING and Hiconnex Industrial are looking to develop a long-term partnership.